I wanted to quickly share my recipe for an all-natural foot soak that works great for treating abscesses, thrush, seedy toes, bruises, etc. This recipe will not compromise live tissues and in non toxic, so no risk to your horse's skin, hair or health. Mix in a rubber feed tub and stand your horse in it for 20-30 minutes. In most cases, one or two treatments are all I need to get the issue resolved. 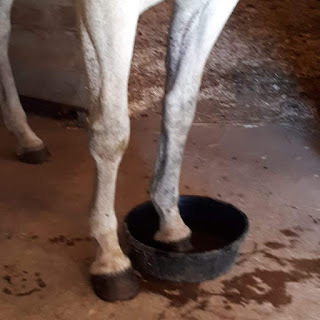 I can actually treat 2 feet at a time that way, my horses are confident with the idea, so they just chill and relax as they soak - just another form of ground tying. Note: Thieves Household Cleaner is sold by Young Living (see the Essential Oils tab on this site for more info). 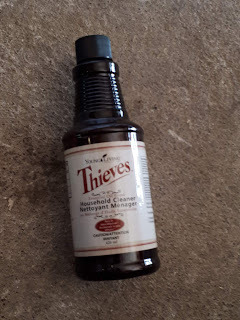 In addition to being a great all purpose cleaner for the home, it works well to clean and sanitize brushes and combs, as a wound wash (diluted) and for a host of other applications. The small bottle goes a long way since it is very concentrated. Bonus, it smells wonderful! Young Living products are available all over the world, including in Canada from a Canadian warehouse.